4 Why investing in a camping toilet is a good idea? 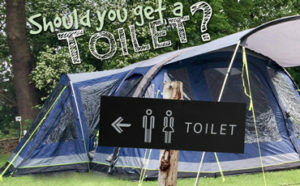 9 How Do Camping Toilets Work? 10 How to Clean and Maintain a Camping Toilet? 11 What to Do with the Waste? Did you know that the average person goes at least once per month outdoors, camping, or even on a day-time barbeque spree at the nearest green site? We all need a bit of fresh air every now and again. Still, what do you do when you had too much food or too many drinks, and nature calls you? The average person goes into the woods. However, a smart camper will start looking for the best portable camping toilets to make nature’s call a less dreadful process. Still, finding the best RV toilets – and other camping options – is not easy, which is why some good camping toilet reviews are needed. If you are going on a camping shopping spree, use this article as a guide to make the right choice for yourself. Dimensions : 14 x 16 x 15.5"
Dimensions : 14.7 x 14.7 x 14"
Dimensions : 15.1 x 5.1 x 15.1"
Dimensions : 16 x 13 x 13"
Dimensions : 16.5 x 14.6 x 16.9"
Dimensions : 25 x 25 x 25"
Those looking for a comfortable camping toilet that will make them feel at home will find the Camco a very fitting choice. Featuring a 5.3-gallon capacity, this one is large enough to hold a decent amount of waste before you have to empty it of its contents. 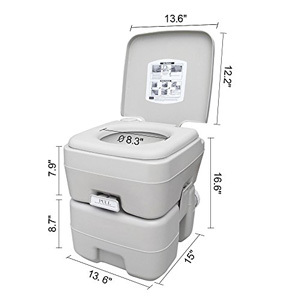 Featuring a sturdy construction and secure side, this portable toilet won’t tip over, and it will allow you to do your business without any worries. Plus, the hand-operated flush system and the sealing will prevent odor from coming out – even if the waste is still located in the toilet. Considering the features of this unit, as well as its ability to retain odor, you may use it both within a shelter and inside an RV. This self-contained toilet is another good option when it comes to camping. Most products sacrifice comfort to increase portability – but not this one. 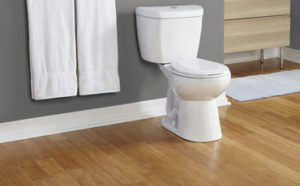 Having a rounded, contour toilet seat, this will literally make you feel as if you are sitting on a chair. 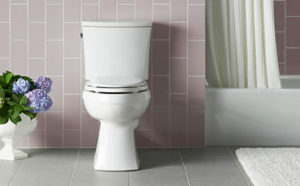 The waste bucket is emptied easily by removing the toilet seat – without the risk of touching the waste. 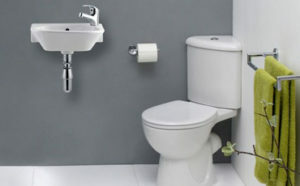 Plus, the lid features a toilet paper dispenser that allows you to easily reach and wipe yourself. The unit is lightweight and is therefore easy to carry. Its reduced size makes it easy to place in the trunk of a car. When you are really tight on space and you dislike carrying a lot with you when you are going camping, then you might want to consider the Fold-to-Go from Reliance. 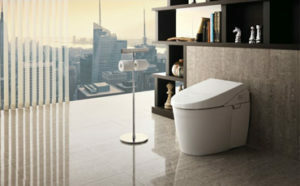 Measuring only 5 inches when folded and weighing 4.5 lbs, this toilet is as portable as it can get. The legs may be a bit shorter compared to other high-tech toilets, but this also makes it compact and perfect if you have kids. It’s easy to clean, sturdy, and removing the bags is an easy, mess-free process. 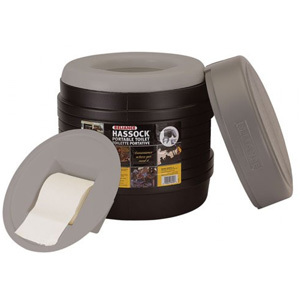 The Hunter’s Loo is an economically-priced toilet that campers generally buy when they are on a budget. 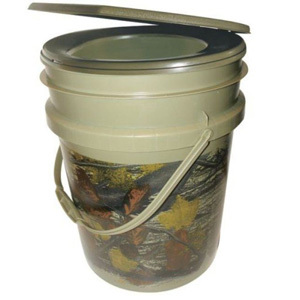 It looks much like a bucket with camouflage design that also features a toilet seat. With a 5-gallon (20L) capacity, this portable camping toilet can hold a good amount of waste – making it perfect for family camping trips. It is also very sturdy, which means that you won’t tip over when you’re doing your business. When going outdoors, some people want something that looks like an actual toilet. This item might be the right one for them. 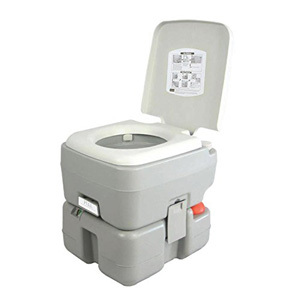 Featuring a 3-way pistol flush, this toilet is perfect for outdoor environments and for indoors (RVs) as well. 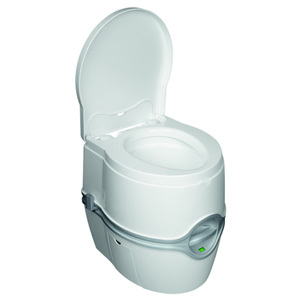 This travel toilet also features a sealed waste tank, which will prevent any odors from coming out as you flush. Plus, it has a level indicator, which will tell you exactly when it’s time to empty the toilet tank. We all want to have some privacy when we go – and most of us don’t like walking great distances until we are out of sight. This is why this toilet with its own shelter system is a great camping solution. The item is foldable and compact, making it easy to pack and carry it around with you. Furthermore, the shelter resembles a mini-tent that allows for a standing position – while also being easy to pack in a bag. It’s very sturdy, and it will allow you to do your business without anyone disturbing you. Dimensions : 18 x 18 x 16"
Dimensions : 17 x 15 x 13.4"
Dimensions : 16.5 x 16 x 14.5"
Dimensions : 17 x 16 x 14.1"
Dimensions : 16.4 x 15.5 x 13.5"
Dimensions : 13.6 x 15 x 16.6"
Portable RV toilets are a great, non-smelly solution for those that do not want to go outside when the business has to go down. Ideally, you should place your portable toilet outside – but if it’s raining or it’s too dark, you don’t want to step foot outside just to take a wiz. Portable camping toilets for RVs generally have two tanks: a water or pressurized tank that will clean away the waste, and a second tank that will trap the waste. The two tanks are separated by a valve, therefore preventing any odors from coming out. This way, you won’t be turning your living RV room into a smelly wasteland. If you are planning on going RV camping, here are some options that you might want to go for. When you are traveling with an RV, you want something that won’t release the smell of death close to where you are sleeping. 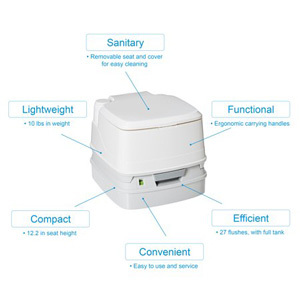 With a 4-gallon water tank capacity, this portable potty will cleanse away the smell. Odorless, leak-proof, and with a very compact design, this is something you can easily leave in the corner of the RV. The bags are also easy to remove, and the potty can hold around 5 gallons of waste before you’ll be required to change it. This portable toilet was meant to increase comfort and convenience when you’re camping with your RV. Having a durable and compact construction, it will easily hold your weight as you are going down with your business. It may not be collapsible, but it’s still very easy to maneuver – even when the waste tank is full. Thanks to its ergonomic carrying handle, you can easily move it from one place to another, without any discomfort. 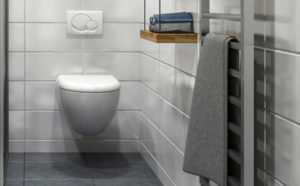 Furthermore, the flush system will ensure that the waste stays isolated, preventing any potential backsplashes as the main waste tank is emptied. Like most RV toilets, this one has the same standard construction: a seat on which you can stand, a waste tank in which the waste goes first (which is also a water tank), and another tank in which the waste is sealed. This portable toilet can hold 3 gallons of water and 5 gallons of waste. Furthermore, the two tanks are sealed by a valve and isolated from each other, which means that the odors won’t be coming out. It doesn’t come with its own deodorizer, but you can purchase it separately and add it to the water tank. It will offer an extra edge of freshness. 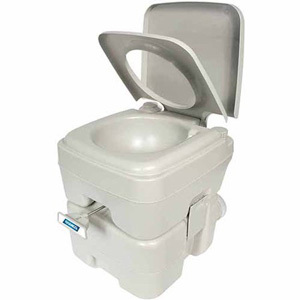 This self-contained camping toilet is another suitable, economically-priced option for RV campers. 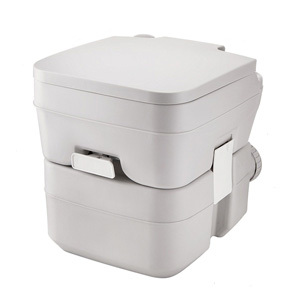 Featuring a bone color and a simple design, this portable toilet is very easy to empty and clean. Plus, it’s lightweight and compact, making it easy to pack even if you are tight on space. The two tanks are separated by a tightly sealed valve, preventing any odors from coming out. 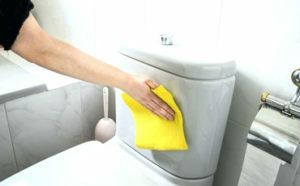 The simple flush system is also very easy to use – especially when you combine it with cleaning agents. Add an odorizing agent as well, and you won’t feel any smells even if the toilet is placed in the same room as you. This portable camping toilet is no bigger than a picnic basket, which makes it a great choice for all campers that don’t like to carry much with them. Granted, the size also depends on how much the toilet can handle. You can go for a 5-gallon capacity or the 2.6-gallon one. The Domestic toilet also has an indicator that tells you exactly how much there is left until the tank is full. Plus, since the two tanks are separated by an air-tight valve, the smell won’t be escaping the waste area – which means you can keep it inside the RV until you can actually dispose of it. 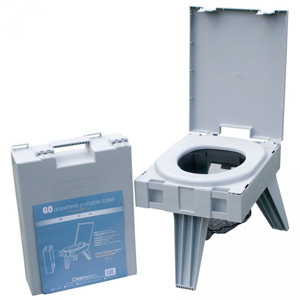 Featuring a sturdy base made from polyethylene, this portable toilet can handle a fair amount of weight. 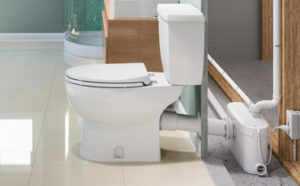 This means that even if you weigh more than the average person, this toilet will not give in and collapse under you. 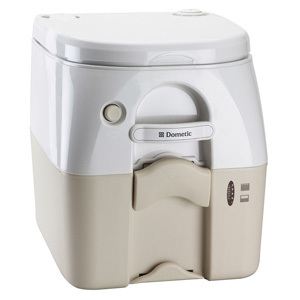 Featuring secure handles and side latches, this toilet is very easy to carry around. Plus, the gate valve will lock the odor inside the waste tank, preventing any leakage when you are carrying it. This way, even if the tank is full of waste, nothing will leak out – even if you happen to drop it. When you are going camping, there are very high chances that you won’t be able to find a toilet anywhere in the close vicinity – except, maybe, if you consider the wild woods. However, this option is not always ideal – especially if you are a lady or you are going with small children. Men have it easy – but women have to squat into awkward positions to make sure things don’t get messy. Not to mention the mess you leave behind – particularly if you “create” something foul. In this case, a portable camping toilet may hide some of the mess and make things easier for you. Why investing in a camping toilet is a good idea? Say you’ve had a healthy dinner on your camping trip; but now, your bowels are pulling the emergency signals. It can be particularly annoying if this happens in the dead of the night when it’s completely dark and you can’t see a thing in front of you. Good luck trying to find a shovel in those circumstances, for digging a hole for your business. When the situation is desperate, all you can do is pull down your pants and hope that the uncovered waste won’t be nuking the entire campsite with the smell. Still, if you get a portable camping toilet, you’ll no longer have to go off behind the trees trying to find a spot. You’ll just have to lift the toilet seat and you can go off on your business. Those who went to events or campsites that had outhouses and porter johns know how foul those places can be. Sometimes, you may come across a decent one. But most of the time, it’s as if toilet brushes didn’t exist. No one even bothers to clean them. Most of us would just hold it in or simply look for the nearest bush. It’s way better than smelling another human’s waste or having chats with the spiders and flies chilling in that disgusting place. Good news, though: with a camping toilet, you won’t have to use those places anymore. You’ll have your own toilet – one that is germ-free and hasn’t been touched or peed on by other people before you. Who doesn’t like being comfortable when they are pooping? Sure, there are people who believe that squatting is the best way to go – but the majority of the people like the advantage of a toilet seat, which literally feels like a throne at that moment. The comfort goes double if the toilet seat is one that you have already been using for a while – and already feel familiar with it. It will be like going with an old friend that knows exactly how to make you comfortable. Only instead of being human, it will be a toilet. There’s no joke when it comes to looking for a toilet – especially when you are outdoors and you feel like your bowels are going to burst out at any second. In this circumstance, a camping toilet will seem like a gift sent from the heavens – since you won’t have to do your business in a hole. However, before going on a camping trip, you first have to determine the kind of toilet that you are planning to use – particularly, its style. 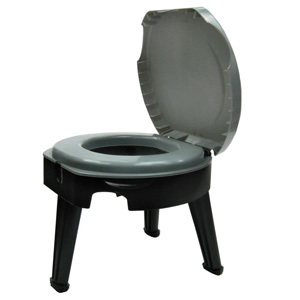 The simplest style of camping toilet is the bucket toilet. It’s like a bucket – only it has a seat covering it. These toilets also go under the name of potty pails or bucket potties, and they are generally the low-cost option for those who want to get the job done. These toilets are generally lighter in weight, which is something one should look for when shopping for a camping toilet. It’s also simplistic in design, making it less likely to break down when you need it the most. Collapsible (or foldable) camping toilets are some other low-cost options that you might feel comfortable carrying around with you. There are several designs that you can go for, but the basics remain the same: a seat, a bag for your waste, and a tubular frame that collapses when it’s not in use. Due to their ability to fold, these tankless toilets represent a good option when you don’t have a lot of space to deal with. They will easily fit behind the seat of a car, and a high-quality model may also be very durable. 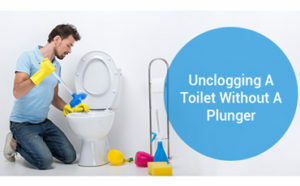 Granted, they might not be as stable as bucket toilets or other types of flush mini-toilets, but they get the job done – and you won’t have to deal with squatting above a potentially dangerous place packed with bugs, spiders, or even wandering snakes. 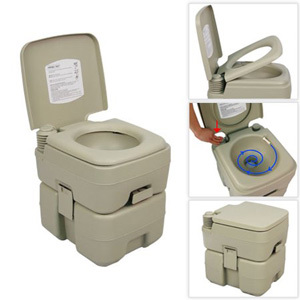 If you are going camping with just one or two people, then there might not be a need for large-sized camping toilet. On the other hand, if there’s a large group, it’s something you might want to carefully consider. Think about how much you’ll be out in the wilderness, as well as how many people will be coming with you. Generally speaking, five gallons should be enough, but if you’re camping with groups larger than 10 people, then you might want to consider something with a bigger volume. If there was even the remote possibility of you bringing your own toilet from home, you would, right? After all, that’s the toilet you are most familiar with – and definitely the one you would bring everywhere with you. Sadly, however, that toilet is stuck to the pipes at home. Moreover, you can’t really carry your toilet with you; that thing is way too heavy. You need something more portable; something that won’t have you huffing and puffing by the time you reach the campsite. Even among “portable” toilets, there are still those that feel too big and heavy to lift. Sure, if you can drop it into a car and take it out at the campsite, then this might not be such a great problem for you. However, if you’re hiking towards the campsite, then carrying a big, heavy toilet with you might be very uncomfortable. It might just make you want to leave it at home. Can you fold this toilet down to make it more compact? Is it compact enough to be packed in a closet or a cabinet? Will it take a lot of space if you pack it inside a vehicle? 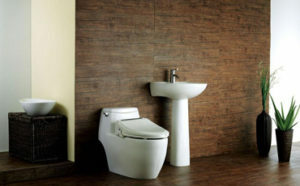 These are just some of the questions that you should be asking yourself if you are planning to go on a shopping spree for high-quality toilets. This is closely related to portability, but not exactly the same thing. A camping toilet may be very compact – but depending on its features, it can also be very heavy. And heavy does not go really well with camping. Whatever the situation, lighter is also better. You don’t want to kill your arms in an attempt to move a toilet from the car to the camping site. 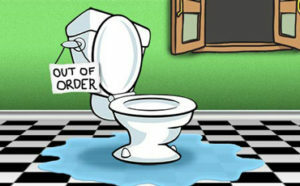 Imagine this circumstance: you are sitting on the toilet, minding your own business, and the whole thing starts wobbling. The last thing you want is for that toilet to tip over and send you into a crappy situation – literally. A camping toilet has to be robust enough to handle your weight – and not break down under you. Plus, it needs to have superior stability so that you can go down with your business without any worries. The more whistles and bells a camping toilet has, the likelier it will be for it to malfunction. Furthermore, if it’s very fancy, there’s a high chance that it will also be troublesome to pack and carry around. For this reason, you may want to make sure that your camping toilet has a design that is as minimalistic as possible. This will make it much easier for you – and give you fewer things to worry about. Compact toilets for camping need to be clean – and at the same time, they also have to be easy to maintain. If it has countless nooks and crannies, then you will obviously dread having to clean it after every camping trip. Simple is always better – and if it’s easy to clean, then it will also make things better for you. A clean camper is always a happy camper. One of the first questions you will have to ask: how bad will this smell? Obviously, you wouldn’t want the smell to start spreading across the entire campsite – so you need to choose something with at least some odor-management features. Normally, most portable camping toilets have a double seal that will prevent the odor from making its way up from the toilet area. As a result, generally speaking, you should not have any issues with odors. If you notice any odors coming from the toilet, it might be because there is debris preventing the seal from closing correctly. Another reason may be a defective valve, in which case you might want to consider replacing it. No one wants someone else to see them doing their business, which is why privacy should also be a matter of concern. Some portable toilets come with their own privacy system – a small shelter that gives you just enough place to sit on the loo. These shelters are basically miniature-sized tents. They can come with the product, or they can be sold separately – depending on the model. This will provide you with a private space so that you can do your business without anyone looking at your privates. How is the waste disposed of? Does it come with a bag that you have to dispose of on a regular basis – while dealing with fresh poop? Or does it have a way of turning waste into compost so that you don’t have to deal with any discomfort? Make sure that the brand you choose comes with biodegradable bags. This way, you can dispose of them (bury them) without worrying that you are harming the environment. In the end, it all boils down to comfort. If it’s not comfortable, then you won’t want to sit on it – and you’ll prefer the bush near it just so that you won’t have to go through it again. Obviously, every portable camping toilet will have you squatting; it’s something you just have to get used to. Still, there are some matters of comfort that can completely be chosen by you – such as the shape of the seat. Choose something that is wide enough to support you and give you the space to do your business. It won’t be as comfortable as your home toilet, but it can be close enough. These camping toilets also go under the name of chemical toilets. These seats allow you to sit directly above a vault, and once your business is done, you flush using the reservoir found directly under the seat. Most of these portable toilets will use a strong chemical to reduce the strength of the odor while also performing a partial waste disinfection. This way, it will be much easier for you to deal with the disposal, without being exposed to the full-blown power of the smell. Some of these toilets leave the waste exactly where it is – but others separate it, and then circulate the chemically treated fluid throughout the toilet tank. The chemicals will kill all the nasty stuff, so the process is relatively hygienic. Plus, these toilets have their own system of collecting and sealing the waste in the bag. If the bag is high-quality, then you won’t even feel the smell as you are disposing of the waste. 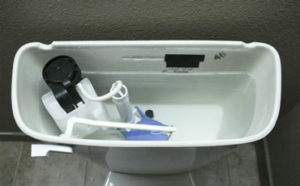 Some flush camping toilets use a dry system, without any chemicals involved. Instead, they use air pressure to seal the waste in compact form, allowing for easy disposal. Considering that the waste is not completely disinfected, you might want to avoid discharging the waste above-ground or above-water. If you don’t have a disposal place near the campsite and are planning to stay there for a few days, then you might want to go the classic way: take it out and bury it cat-style. Flush camping toilets are also considered the “fancy” type, which means that they might not be that lightweight or portable. However, if you have the advantage of a bigger car to carry the camping gear, then this is probably the most comfortable way to go. These are the most common types of camping toilets, mainly because they are the least troublesome to deal with. Basically, with a bag camping toilet, all the waste will be caught by a bag – one which you’d have to dispose of after every use unless you want it to start stinking. 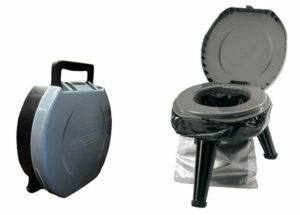 A bag camping toilet might also be in “flush” form but it can also be a simple, foldable toilet. In this case, you may have to seal the bag yourself – unless the toilet has its own bag-sealing system. Most people go camping in their tents – but there are also people who prefer camping in the more comfortable RV. Most of the time, these people prefer using composting toilets, for situations when they can’t really dispose of their waste at ease. These camping toilets will basically turn the waste into fertilizer that you can safely drop onto a plant once it’s done with. Plus, the way it deals with the waste makes it less smelly – turning it into the perfect option for an RV. These toilets generally work with an incinerator that will literally turn the poop into ash. However, there are also toilets that simply use strong chemicals to make the compost dry much faster. It all depends on the brand that you are intending to purchase. How Do Camping Toilets Work? So how do these camping toilets work? You might think it’s something groundbreaking, considering these toilets were brought to such a portable, lightweight level. However, the truth is that the technology of these toilets if very simple. The average camping toilet will have only a seat, something that will prop you above ground, and a catching system to collect all the waste. Nothing complicated there. Most portable camping toilets have waste bags that allow you to easily dispose of the deposit – without actually being in direct contact with it. Imagine if you had to clean the insides, without the addition of a bag. It can get pretty nasty. With this toilet type, all you have to do is lift the seat, do your thing, and then remove the waste bag. It’s efficient and comfortable, all at the same time. How to Clean and Maintain a Camping Toilet? Depending on the toilet, it may or may not come with specific maintenance instructions. Based on where you are going and how long you are planning to stay, you may want to keep close consideration of the on-the-spot maintenance. The last thing you want is to go for a 5-hour drive home with a foul smell coming from behind the car. Depending on the camping toilet, you may or may not have a lot of maintenance to deal with. Some flush toilets, for example, come with their own cleaning agents and deodorizer that will keep the toilet clean for a longer time. However, you will have to give it a thorough clean once you get home. 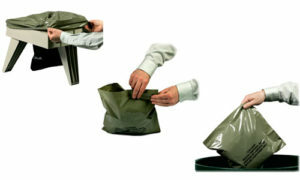 A bag toilet will need to have its bag replaced after every use – preferably using biodegradable materials. If you have to throw it into the waste site, you don’t want it to be trapped into a bag that won’t decompose. Think of the poor souls that might be unfortunate enough to come across your poop bag; it won’t be very pleasant for them. When cleaning your portable toilet, you should do it just like you would with your home toilet – and even more, if it does not have its own flushing system. A clean toilet means a happy posterior – so make sure to keep it clean on-the-go. This is the most important question when dealing with a portable toilet: what do we do with the waste? Well, you can’t just leave it inside the toilet; sooner or later, it will start stinking. Ideally, you should dispose of it immediately after the business went down. If you are dealing with an official campground, the chances are that you will have a dumping station where you can safely and properly dispose of the bag – no questions asked. Most of the time, you should also receive instructions on how to dispose of human waste from the manufacturer. However, if you are not anywhere close to a dumping site, you have no choice but to dig a hole. You’ll need a hole that is approximately 6 inches deep, which is at least 100 meters away from any water source. You need to be careful not to contaminate the water for animals – or even the other campers. Again, make sure that the bag is biodegradable, and the toilet paper you use is the same. Most portable toilet bags will include their own samples, but you may have to replenish every now and again with new bags. If the included bag is not biodegradable, look for separate bag sets. Most of the time, the sizes will fit – but you should also check for dimensions to make sure there aren’t any surprises. Q: What can portable camping toilets be used for? A: A portable camping toilet is generally used when you want to go on a camping spree – but they also have other uses. You can take them in emergencies (for example, if a disaster hits), at large scale events (concerts, festivals), military situations, and other outdoor situations that don’t have any toilets nearby. Q: Where should I place my portable toilet? A: A portable toilet can be placed just about anywhere, but there are also certain places that are more ideal than others. For example, you should place the toilet at a fair distance from the campsite; you don’t want the smell to reach you. Furthermore, you should also make sure that it’s in a well-lit, easily accessed area. The last thing you want is to trip over your own feet because you can’t see anything in front of you. You should also make sure that the sky is not completely covered by trees. If the sun has set, you should at least be able to get some moonlight. Lastly, make sure that the ground is level and stable. The last thing you want is for your toilet to tip over because it doesn’t have the support. Q: Will the water inside my portable toilet freeze at night? A: This will depend on the toilet that you choose. For example, lower-end models will have a much thinner tank, which may allow the water to freeze if it’s particularly cold outside. On the other hand, there are also certain toilets that have anti-freezing features. This will insulate the tank and prevent its contents from freezing. You may also add a certain liquid within the tank that will prevent solidification of the water. You may purchase it from any store that sells toilet extras. Q: How often should I clean my portable toilet? A: Ideally, you should give it a wipe on the toilet seat after every use. This will prevent the microbes from spreading, and it will ensure everything is hygienic. Plus, you should also ensure that you dispose of the bag after every use, lest you want other people to also encounter your waste. Other than that, it will all depend on the model. 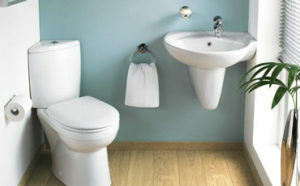 A typical bag toilet that looks more or less like a bucket will have to be thoroughly cleaned after every use. A flush toilet, on the other hand, that looks like a mini-toilet can be thoroughly washed every few camping trips. However, a golden rule is that if it smells or it’s stained, you should definitely wash it. Seems logical, doesn’t it? Q: Are chemical toilets smelly? 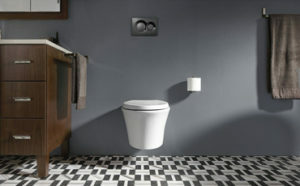 Chemical toilets use chemicals with the specific purpose of preventing the smell. Provided the instructions are followed carefully, there should not be any smelly incidents – especially considering that the chemicals should dry and reduce the odor of the waste. Choosing the best portable camping toilets is definitely not an easy task. Sure, it’s a small device – but there are so many features to consider that it’s not even funny. Of course, you may do your business behind the nearest bush – but we’re civilized, regular people, not barbarians. We need to eliminate our waste like the classy people we are – which is why a portable toilet is a must-have on a camping trip. 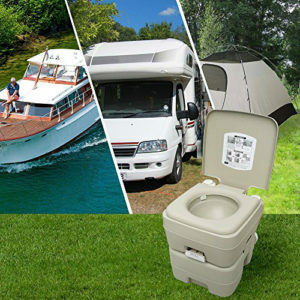 Are you looking for the best RV toilets? Or are you just looking for a toilet that you can hide behind a bush, away from your camp? Hopefully, these camping toilet reviews allowed you to make your choice so that you have a comfortable outdoor experience.